South Plaza is located east of Santa Cruz Island. It forms part of a pair of islands known as “Islas Plazas”. It is also the only site that allows visitors on these Islands. Here, despite its small size, you can find some of the most interesting and outstanding species of the Galapagos Islands. 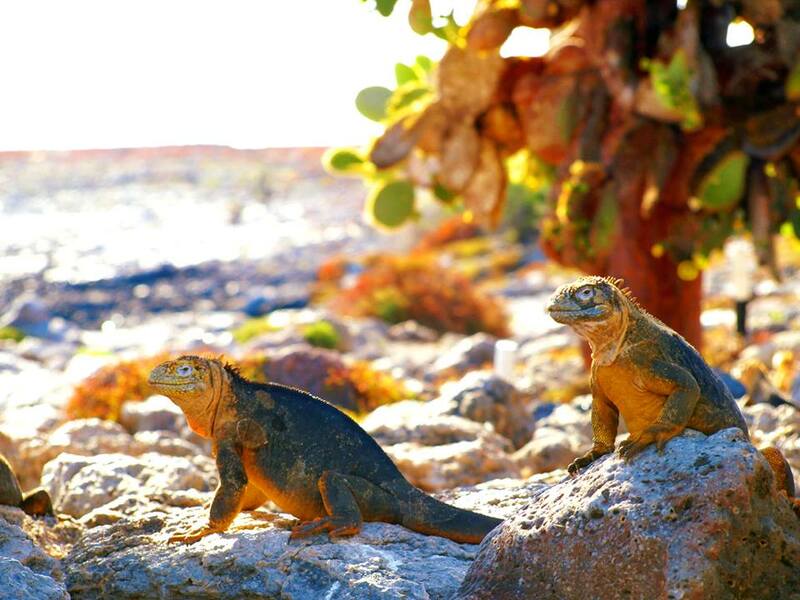 Upon arrival, you can instantly see hundreds of iguanas resting and soaking up the sun on the shoreside. The big population of iguanas is due to the presence of tuna, their favourite food. However, that’s not the most incredible thing about this site- throughout the island there are several hybrid iguanas. These are a result of crossing a marine iguana with a land iguana. They are extremely unique and can be recognised at first glance by their black/grey colour and land iguana’s crest. Incredibley, they have the face and tail of a marine iguana! Have fun trying to distinguish the iguanas apart according to their characteristics. This is a great example that there is a wide variety of beautiful animals that you can find everywhere and anywhere in the Galapagos Islands! These incredible animals are just ONE of MANY habiting The Galapagos Islands!